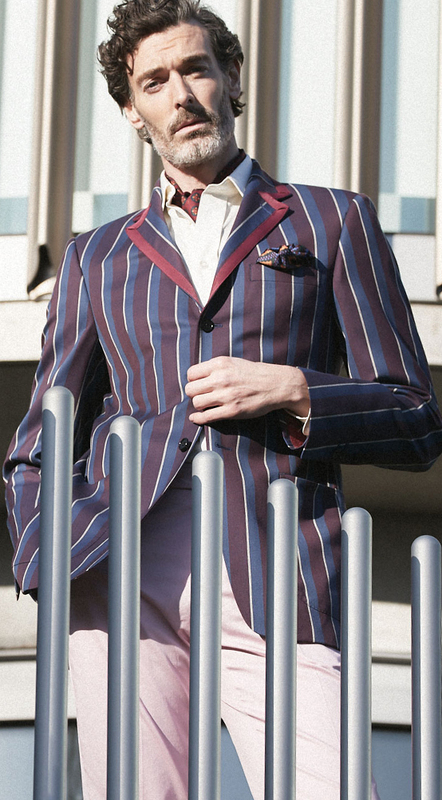 Boating blazers, ‘rowing blazers’, or even ‘boating coats’ as they’re called on Savile Row, can be an acquired taste. We presume you’re here, reading this, because you are either curious to try one or an experienced connoisseur of these colourful jackets. Hopefully both. 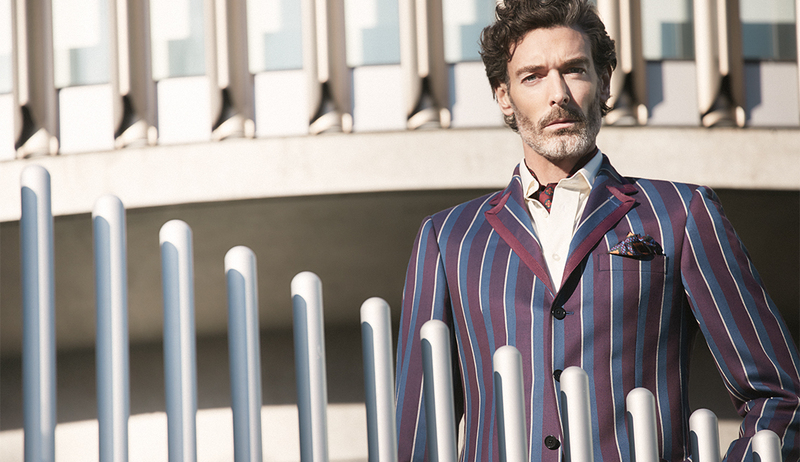 Despite its unmistakeable stripes, the boating blazer’s iconic status is a happy accident. The first recorded use of the term is in 1825, to refer to the bright crimson jackets of Lady Margaret Boat Club, the rowing club of St. John’s College, Cambridge. Legend has it the ballsy rowers cut their jackets from red billiard baize to stand out from the crowd – think of their jackets as Georgian varsity bombers, if you will. The fashion caught on, and by the 1850s, the bright club blazer was an international sensation, worn by preppy public school sportsmen across Britain and America. The navy blazer was in-part introduced as a response to this craze – a sober alternative to wear in polite society. Of course, the blazer’s story is inextricably linked with another sporting institution; the Oxford and Cambridge Boat Race. It’s 190-years-old this year, and is taking place on Sunday 7th of April. 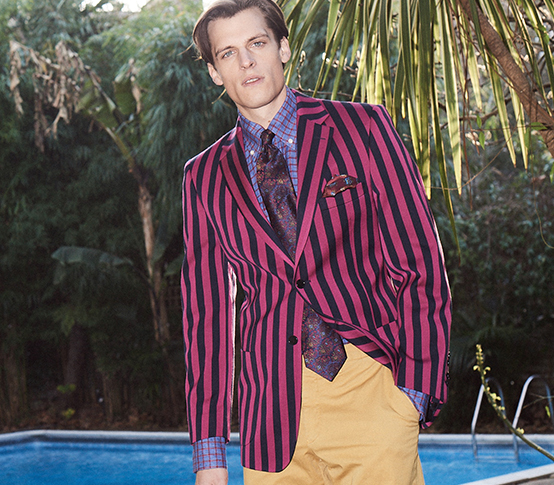 It’s also the perfect opportunity to embrace the boating blazer in all its technicolour glory. 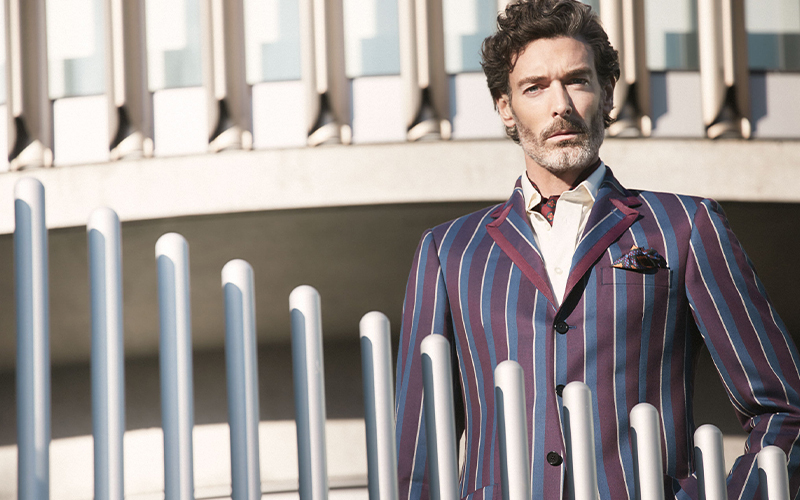 Head down to the banks of the River Thames between Hammersmith and Putney, and you’ll see thousands of well-dressed men sporting striped blazers of every style and shape. By this point in the story, you might have guessed that the boating blazer is a New & Lingwood speciality, and this summer we’ve cut two; both finished with our signature grosgrain edge tapes. The first is cut in summer-weight Tartan (Heather Isle Tartan to be precise) with two buttons to fasten, straight flap pockets and a ticket pocket at the waist for a rakish silhouette. 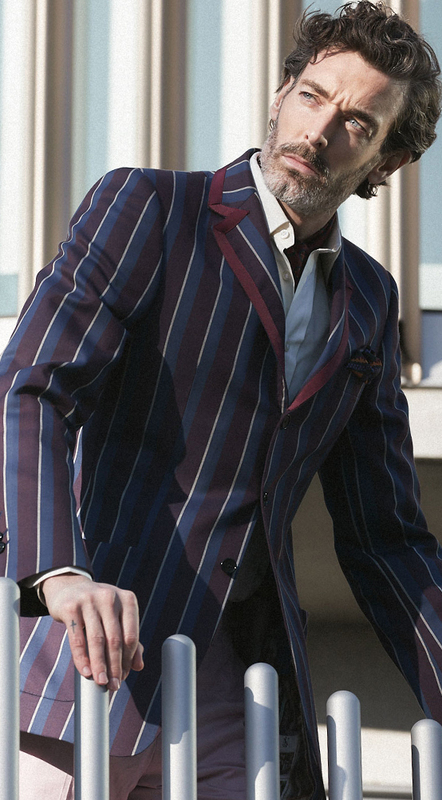 The second is the Newton Stripe cut in a handsome burgundy, navy and cream striped cloth from Fox Brothers, with three buttons to fasten and patch pockets at the hips. 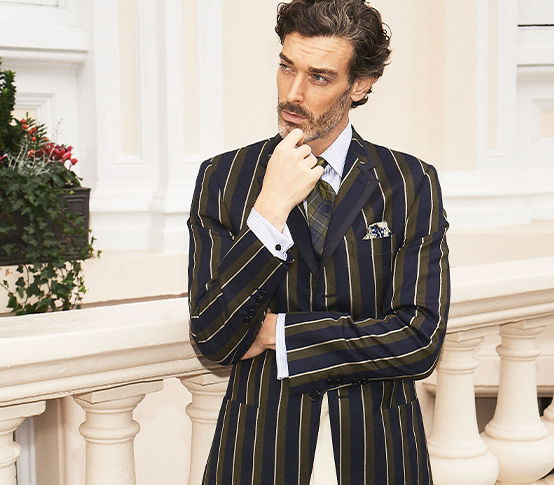 We match the stripes or checks across each blazer’s pockets and each jacket is cut with a half-lining for comfort. Today, there are a number of ways to dress a boating blazer. We like to keep the Heather Isle Tartan jacket clean and simple; layered over a purple or navy cotton crewneck, paired with our mid blue Cowdray linen trousers. 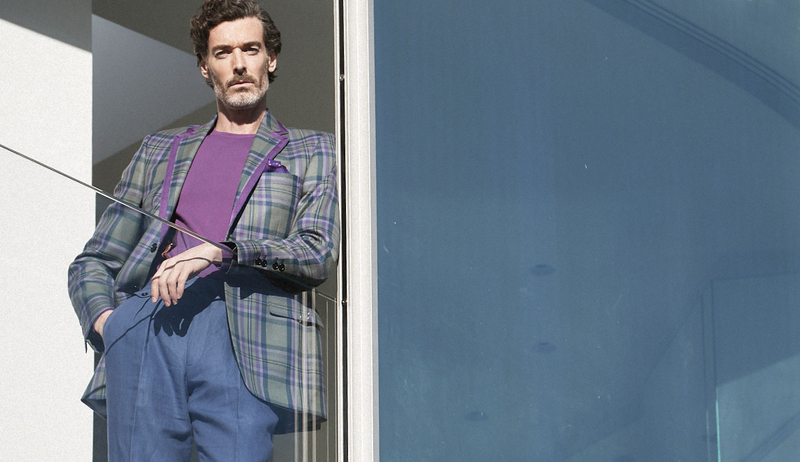 If you’re a stickler for tradition, then it pays to keep things simple with a bold jacket. Try a plain sky blue poplin shirt with a sober deep purple or bottle green tie. As for the Newton blazer, its rich burgundy stripes lend themselves to a plain white shirt, dressed with a navy textured tie or a silk ascot tied beneath the shirt’s collar. We’d also recommend finishing this outfit with a pair of our navy fresco trousers – we’re offering flat-fronted or forward pleated models to choose from. Of course, if stripes aren’t your thing, you could also choose our navy Yarmouth Hopsack Blazer too, in either a single or double-breasted cut. The Yarmouth sits comfortably with pale tailored trousers; try our sand cavalry twills – or if it’s warm on the day, our cream Cowdray trousers in the best Italian linen. 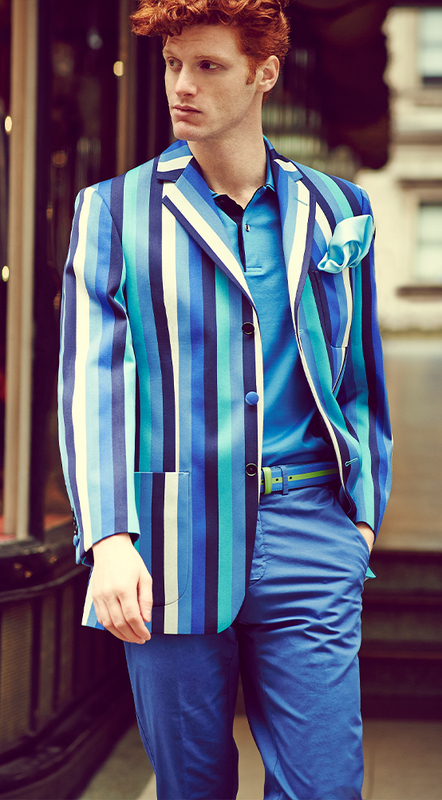 Whether you’re a navy blazer man or you just can’t resist bold stripes, we hope these styling tips will help you to cut a dash at the Boat Race this year, and well into the summer season beyond.